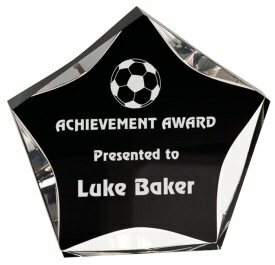 Star shape clear black luminary one inch thick free standing acrylic trophy. Unique, contoured bevel design creates a radiant award. Free detailed reverse laser engraving on this 1 inch thick acrylic adds dimension to this special award. Before shipping, a proof will be emailed for your approval.